Florian (I) is currently with colleague Roza Laptander doing fieldwork in Yamal for a project called ORHELIA. The acronym ORHELIA stand for “Oral Histories of Elders in the Arctic” and is a project that looks at how remote northerners have experienced the historical and cultural changes of the 20th century in their own biographies. I was planning to give you some more regular updates from the field, but the conditions turned out to be so hard this time that there wasn’t even time to THINK about anything close to blogs or the like. It is hard to imagine that you are somewhere in an Arctic snow desert where the closest mobile connection is 150 km away, the closest satellite phone that could call a helicopter around `100 km away, let alone any internet. And you live completely without electricity, which makes it impossible to record field interviews, shoot videos or the like. You save the last battery power for some photographs, which is what I did. Tyude Okotetto and his daughter, with Florian and colleague Roza Laptander. It’s at about 72.5 degrees northern latitude and 72 degrees eastern longitude, and other than Finnmark has a much harsher climate. We had -20 most of the time, but around April 18 a sudden warming up, reaching above the freezing point, making the snow wet. During this warming time, we were blessed with a classical snowstorm that made it impossible to find the next family. Searching around by snowmobile under such conditions is a pretty silly undertaking, given that petrol is REALLY limited. Not only is it expensive (same price as in Finland), but also is the next place to get it officially is around 250 km south. Try to sit on a wooden sledge at a speed of 50 and jump for 2 metres over a hump. Your spine bones will have contracted all into one. To prevent this from happening, you better spread the shock to a broader base by lying in the sledge. But then you are in danger of hitting your head on to the sledge – which is what happened to me too many times. As soon as it clears up next morning we hit the tundra (of course not the road, because there is none), and have another 120 km to Se Yakha, the village from where the helicopter flies to the district capital. PS: From Se Yakha: Two injections, blood pressure reducing pills and some hours quiet lying down in the village hospital helped a bit to be prepared for the helicopter flight. This entry was posted in All, Fieldwork, oral history, Russian North. Bookmark the permalink. WOW! Stumbled accitentally over this pages seeking for something else. Compliments! What can we say about the old time when our elders used to live? We do not really know so much about that time. Maybe because it was not so interesting for us before, or we just did not know how we could use this knowledge. But at one point of our life it could happen that we could need it ourselves. Why does it happen that we sometimes do the same mistakes, which were already done in the history of our nation? Let’s take as an example my nation. 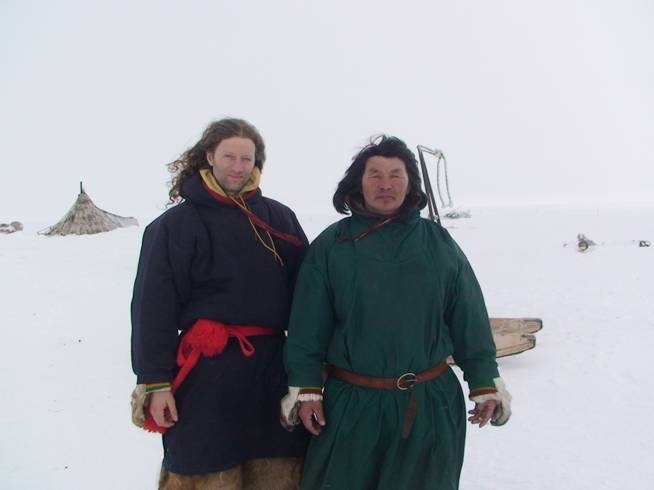 Nenets is one of those nations of the North which is quite flexible and mostly tries to take new changes to be useful in their life, but not changing traditional culture so much. We saw this during our trip in Yamal peninsular in Tambejskaja tundra, Western Siberia. First impression during trip was that it is a bit strange but at the same time painful to notice one thing. People who live here on top the richest gas deposit areas of the Russian Federation do not have any fuel resources but wooden logs which are taken here by lorries from the settlements. This wood is taken very fast mostly by young people and old ones to not have enough even for warming their tents because they do not know when wood will be brought to tundra. Tundra is so poor by its vegetation. How people used to live in these coldest and severe conditions before? It was told by people themselves – their parents and grand parents used to migrate to the south in autumn and nobody used to stay here for the dark, snowy and severely frozen woodless tundra for a long winter time, but just very poor people who did not have enough reindeer for migration or sea area hunters. People used to migrate for hundreds kilometres from the top of Yamal to Obdorsk and far south to Tobolsk, to the capital of Siberia, for trading and work. Most of them used to spend long winters in tundra-forest reach of wood and good pastures, not suffering so much from cold. What changed this rhythm? What stopped people from following this migration route? The answer was not so surprising. Collectivization… It was the Soviet time collectivization of the 30’s and 60’s, which damaged nearly every family of the newly built country. When all nations were under pressure for being taken under total control of the Soviet power. 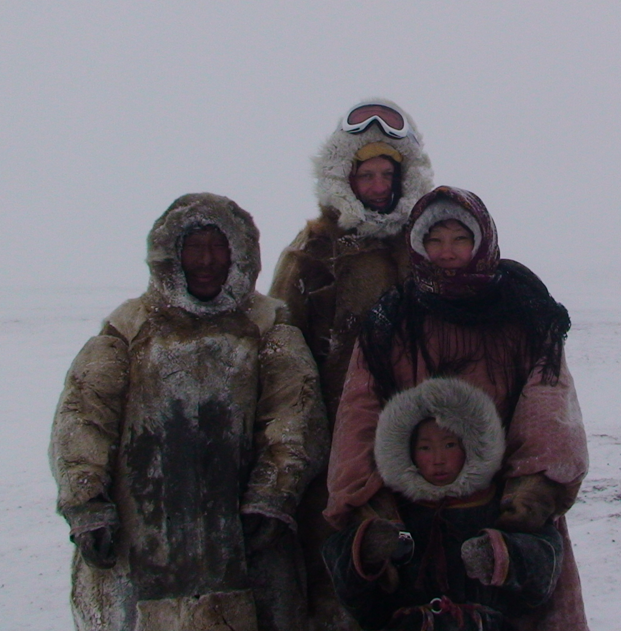 Nenets were also, in a way, part of this tragedy. What could old people say about this time? It was difficult for them to understand completely what Russians wanted from them but they tried to do their best. Of course, there were protests, but those who were against the new regime were severely punished. So, reindeer herders gave their reindeer for the newly formed state reindeer breeding brigades. Hunters were hunting, trying to give to the state as many polar foxes furs as it was possible. Fishermen were fishing, even this occupation was new for the ex-reindeer herders and the other way round for new reindeer herders who used to be just fishermen. Everything was turned upside down, radically changing many important living conditions of Nenets people. One story line and many people who had the same life… The same life, the same destiny, or it is just one fortune of Nenets nation? Or maybe it was just told like this by Nenets elders, hiding between lines their pain and deep sorrow.